I am sorry to report the very sad news that Roger Alan Dobson, author, journalist and bookman of Oxford, has died. He was the co-editor, with me, of several booklets about Arthur Machen, of Aklo, the journal of the fantastic, and The Lost Club Journal (devoted to neglected writers). He also wrote radio plays, including a successful BBC Radio 4 production about the Kingdom of Redonda, the Caribbean literary realm associated with M.P. Shiel and John Gawsworth, which fascinated him: in recognition of his work here, Spanish novelist Javier Marias ennobled him in his Redondan court as the Duke of Bridaespuela . Roger was proud of his Manchester upbringing, and wrote a study of Ann Lee, the Manchester Messiah, about a local prophetess. He was a regular contributor to the Antiquarian Book Monthly Review (ABMR) on recondite literary subjects, including one article which made out the case that Sherlock Holmes must have gone to a Manchester college. This exhibited the sense of mischief Roger often brought to bookish matters: he was also implicated, with his friend the bookseller Rupert Cook, in the letters and writings of the hoax poet (who showed signs of coming alive), C.W. Blubberhouse. 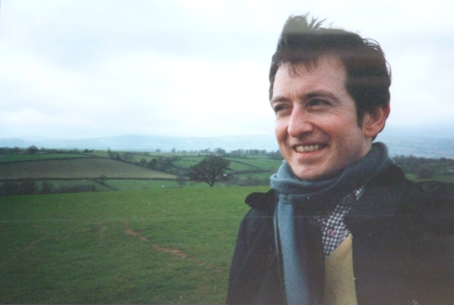 He also contributed lively and learned material to Colin Langeveld's Doppelganger Broadsheet, sometimes as the querulous 'Professor Herbert Trufflehunter'. I came to know Roger in the early Nineteen Eighties when I was told he was an enthusiast of Arthur Machen, whose work I discovered at the age of seventeen. This proved to be a considerable under-statement. Roger knew more about Machen than anyone else I ever met, and between us we started a modest campaign to revive interest in him, which was at a low ebb in the early Eighties. We met or corresponded with many who had known Machen, including his son Hilary and daughter Janet, and close friends such as Colin Summerford and Oliver Stonor: in time, we found others who were intent on celebrating him, leading to the Machen societies, journals and other publications since. Roger wrote the Machen entry in the Dictionary of National Biography, after rightly arguing for his inclusion: edited John Gawsworth's biography of Machen; co-edited Machen's Selected Letters (with Godfrey Brangham and R.A. Gilbert, 1988); and contributed to Faunus, the journal of the Friends of Arthur Machen, with illuminating essays on Machen mysteries. A checklist of his writings is in preparation. But Machen was far from Roger’s only literary interest: he was immensely well-read, and talked charmingly and with infectious enthusiasm about many other, especially semi-forgotten, figures. For some years he and I would meet in Oxford, where Roger had a bedsit at 50, St John Street, a former home of Tolkien, and have long talks about books and authors who ought to be revived. Roger’s special passion after Machen was George Gissing, whom I then did not quite get (I suppose because he was insufficiently ‘like’ Machen): but he insisted on the wonder of The Private Papers of Henry Ryecroft, and I have recently come to see why: how I wish I could tell him. Roger had been a journalist in Manchester and Bristol, and still occasionally did freelance work, but (like Machen) he came to dislike this, and preferred to write on literary themes. However, he never lost the journalistic knack of knocking on doors to elicit information, when he wanted to pursue a writer’s homes and haunts, which included Machen’s house in the Chilterns (then owned, to Roger’s delight, by a gentleman with the Welsh kingly name of Cadwallader); and the grave of the alchemist Thomas Vaughan in an obscure Oxford village (“the graveyard plan is on the back of a cornflakes packet”, the sexton told us). Roger was a very private man: though I was among his closest friends in those Machenstruck days, I never learnt very much about him, except his bookish enthusiasms. He was devoted to literature and, as with Machen and Gissing, it seldom rewarded him materially: but it gave him rarer things; the joys of scholarship, shared discoveries, and the stubborn integrity of a proud spirit. 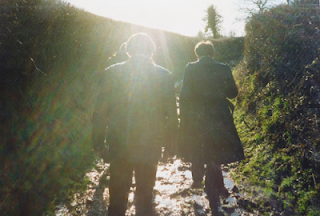 Below: Roger Dobson (right), with other Machen friends, striding off down the old lane from Llanddewi Fach to Llanfrechfa, a favourite walk of Machen's (photographs: Iain Smith). Very sorry to hear that - he sounds like someone who would have been nice to know personally. We corresponded only occasionally and met rarely, but I counted Roger as a friend and greatly valued his knowledge and judgement. I haven't quite got used to the thought that he isn't there any longer. Much saddened at Roger's passing; he was a talented writer,yet always unassuming. Roger was a true gentleman and will be sadly missed. His writing is a tremendous legacy. Very sorry to hear of the loss of Roger. I can say without exaggeration that he was one of the most delightful people to engage in conversation that I have ever met. He was good listener and always contributed with intelligence to whatever topic I happened to raise. I recall with great affection his hilarious stories about the dog at No. 50 St John's Street who used to soil the carpet. Thank you for your tributes to Roger. We hope to organise a memorial service, and will announce details here when these are confirmed. Very sorry to hear of Roger's passing. I always enjoyed meeting him on his London excursions, and chatting about books, writers and films. He told amusing stories about his experiences as a film extra, and I remember suggesting that he turn his anecdotes into a book of short stories along the lines of Alex Hamilton's 'Wild Track'. The Lost Club Journal will surely stand as a testament to Roger's impressive knowledge of the backroads of literature. I lived below Roger in Oxford and did not know him then apart from two meetings in the flats and the street but he did seem a very private person and only now after they are currently clearing his flat have I discovered anything about him. How sad he died alone. Before this I didn't even know his name, or if he had any family. May he rest in peace, obviously a very academic, intelligent and well loved man. I would like to know more of him if anyone that did know him can tell me more? Thanks Mark, I have done and to your contact email on the friends of Arthur Machen page. Thank you to those who have kindly left comments about Roger. I would like to quote them in a tribute booklet. Please let me know if you would prefer not. I never met Roger Dobson, but I feel as a reader of several of his introductions to the works of Arthur Machen and as an accomplished essayist that I owe him many thanks. I warmed to him as a writer of elegant prose and as an authoritative figure on Arthur Machen. Having read his contributions to Faunus (The Journal of the Friends of Arthur Machen) over recent years I always looked forward to his essays as being reliably polished pieces of prose, full of interest and insights. There is much of Roger Dobson's writing I haven't read. I will try to find more of his written output, but I shall read each new piece when I come across it with a sense of regret, knowing that his flow of creative energy has stopped and that there will be fewer opportunities in the future for me to read remaining material authored by him that is new to me. I am sad that all the expertise and knowledge he had cannot find a way of being expressed in the future and that his literary output has come to an end. But I thank him wholeheartedly for his endeavour to illuminate the lives of people like me. I have fond memories of him taking me round the Tate Modern when it first opened. I have only today heard of the sad news that Roger died last year. This is to flag up the fact that I knew Roger from Secondary School and that we were part of the same social meeting group back in the 1970s & 1980s. I will be passing this news on to other people over the next few days who went to school with Roger, one will probably have known him since he was 5 years old. Roger was a local journalist at the time of my wedding and we have a picture, albeit in black & white, of us with Roger & some of the group, taken by his photographer. I will be putting more details on this site in the near future which might give a little more insight into the young(er) Roger Alan Dobson. I'm sooo sad to read my dear pal Rodger has passed away. We were great friends in Oxford 1993. We lost contact when I left U.K. I have searched the internet for years trying to locate him.